Here at Jaruda Cockapoos we are passionate about our dogs. The Cockapoo, generically speaking is a cross between a Cocker Spaniel and a Miniature Poodle. With this in mind, Cockapoos can come in many different variations of size, colour and coat type depending very much on their parents. 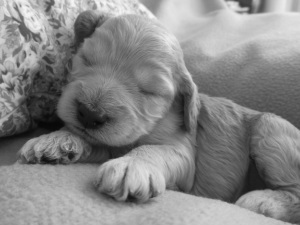 At Jaruda Cockapoos we exclusively breed F1b, F2 and F3 Cockapoo puppies and are dedicated to producing healthy, happy companion dogs that will grow to be treasured members of your family. 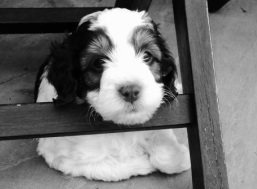 F1b Cockapoos are achieved by breeding an F1 (first generation) Cockapoo back to either the Miniature Poodle or Cocker Spaniel. Our F1b puppies are all F1 English Show Cockapoos bred back to a Miniature Poodle. F2 Cockapoos are the result of breeding an F1 (first generation) with another F1 Cockapoo. We do this to produce a curly, low shedding, low dander coat and retain the 'Teddy Bear' Cockapoo look. F3 Cockapoos are the result of breeding and F2 (second generation) with another F2 Cockapoo. Our F3 puppies have proven to be very consistent with the unique teddy bear look most people are looking for. Our F3 Cockapoos are bred from a long line of dogs we have owned. In short lines we know and trust. Our dogs are extensively health tested, have great personalities and are very special to us. We encourage you to visit Our Dogs page to meet them. Cockapoos are lively, affectionate and love to be with people. They get on well with other animals and love to play, often taking your lead on activity levels. Cockapoos do require exercise and plenty of mental stimulation. They love nothing more than splashing through muddy puddles and chasing a ball! Our cockapoos come in a variety of coat colours and can have curly, wavy and sometimes straighter coats. Their coats are generally non-shedding however this can never be guaranteed and do require regular grooming. Please click here for more information about Cockapoos.